Isn’t she beautiful! This is Brinley, the newest member of our family. We are so happy to welcome her to our home. She is so precious. From the moment McKenna was born more than three years ago, we wondered if we were done having children or if there were more for us to have. From that moment, I prayed to know. I prayed daily for 2.5 years. I had moments of frustration in not knowing my answer; what I wanted to know was a righteous desire. I thought the Lord must be not telling me for some reason, so I tried to remain patient. I really had no strong hope either way–I just wanted to know. In the Fall of 2010, I heard a talk that spoke of being grateful for the times the Lord makes us wait for our answer. Those are times that He is refining us. So with those words in mind, I continued to pray and remain patient. Fall of 2011 I started to be anxious for an answer again. After much, much effort, we finally had the answer that we should try to get pregnant and see what happens. I figured this was going to end in no pregnancy since I had PCOS (diagnosed after McKenna was born) and had not ovulated in years. My OB had offered fertility drugs, but we didn’t feel good about it. So we tried without much hope. But we got pregnant on the first try. We knew this child was a gift from the Lord and that He wanted her here now. And she has been such a great addition to our home. There is nothing like a baby to realign your goals and remind you of the important things in life. My pregnancy with her was my hardest–which is saying a lot. The difficulty brought us closer together as a family and it brought Brinley and I closer together. She instantly calms at my touch or my voice, and has from the moment she was born (the nurse gave her to me wet and gooey and as soon as I got her, she stopped crying. The nurse said, “No she needs to cry!” and rubbed her to get her going). As parents, we are so much more relaxed. I don’t know if it is our age, our experience, or both. We know things don’t have to be perfect every moment of every day. Life is a culmination of moments and you can’t focus on the little strokes that make the picture. Some strokes are perfection; some are imperfections that make the picture unique and interesting. I am savoring every moment. I am not anxious for time to fly by–I want her to stay as she is–I want to savor each minute. As for the nitty details, she is great. She eats well and for the most part, stays awake on her own to eat–even her first feeding of life she ate for 30 minutes while staying awake. She has some time awake afterward and seems to be able to handle stimulation well (which is good because her three siblings surround her and oogle over how cute she was). Speaking of the three siblings, sidebar, the first time McKenna saw Brinley when she was 1-2 hours old, McKenna said, “Mommy, why was your tummy so big? Brinley isn’t that big. She is little.” Nice right? Brinley goes to sleep from awake without crying and I wake her for her meals. She wakes once in the night. My experience definitely helps make this all possible. I have very quickly recognized things like that she likes to be warm, and even though it is a stifling hot summer, she must have socks on her feet. We are so happy to have her here with us to complete our family. Welcome home, Brinley. Next Post Poll Results: DID YOU GET YOUR OLDER CHILD(REN) A GIFT WHEN YOU HAD A NEW BABY? Congratulations!! Great news – I was wondering if she was here yet! What a great photo. Also, great name choice to fir with sibling names!I would live to read more about your journey to discern Gods will for your family. I have very hard pregnancies and more miscarriages than live births. I wonder if having five kids, our plan since we were dating, is truly Gods plan. Anyway, this is a great insight to me, so thanks for sharing such deep thoughts. What a very beautiful name. What a beautiful and inspiring post! Praise God for this new blessing! She is beautiful! So happy for you!!! Love hearing your story. I am a firm believer in waiting on God's timing. Even when it is a lot sooner than one would expect. My story with PCOS is slightly different. I have had 2 periods in 4 years… But I am pregnant with #3 and #1 is only 2.5 years. And I have a retroverted uterus. 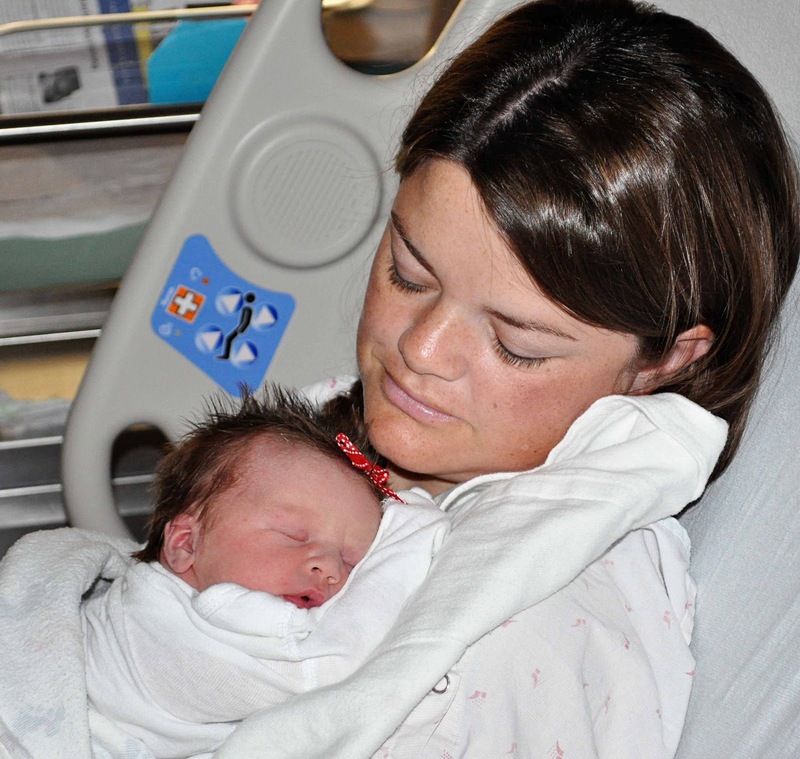 My midwife said, "some people, are just supposed to be here." I am learning to trust in God's timing in a different way, but faith takes a huge leap and most people (even Christians) don't understand that. Your story helps reassure me that God is in control, and it's better if we just give that control to Him. Thanks for sharing! Congratulations!! She is beautiful. So glad all is going well! Congratulations! Thanks for all you do on this blog. It saved my sanity a few times over the last few months. My little Oliver is sleeping well now (turns out it was that he preferred to sleep on his tummy and once he could roll over, the 45 minute intruder stopped). I appreciate you! So happy for your family! Congratulations on a beautiful girl!! I am expecting a girl too, and thanks for the idea! I'll have bows in tow with me at the hospital for those first photos :)If you don't mind me asking, you said her first feeding lasted 30 minutes. Are you nursing or was she bottle fed? I already have one boy, and my first hospital experience was somewhat of a blur. I remember trying to feed him, but the milk hadn't come in yet. And so we ended up giving him forumla, until about 2 days after we got home from the hospital. Then we never had formula again. I am just curious what it's like for other moms. Congratulations again – may God continue to bless your beautiful family! Congratulations Valerie! She is beautiful! Congrats! She is so cute and what an inspiring story! Congratulations!!!!!!! She is so beautiful! What a cutie! She has a lovely temperament, too! What an amazing story about not ovulating for so long and then getting pregnant on the first try! It was definitely meant to be. So sweet! What a perfect little miracle :-)Looking forward to newborn weekly posts and schedules and all things itty bitty baby again on the blog. those posts are always so fun! I love it that you said this:"Life is a culmination of moments and you can't focus on the little strokes that make the picture. Some strokes are perfection; some are imperfections that make the picture unique and interesting. "SO perfectly said. I'm seriously going to write it down and save it to look at again later. Just beautiful. Anyway, Congratulations on your new little one! She's adorable. Hope you have a fast recovery and settle into your new "normal" peacefully. Congrats to you & your fam! She is beautiful…and what a beautiful story you shared. What a BLESSING she is!! Praise God for his gift. Enjoy her Val! Children really are a gift from God!!! How wonderful! I am so excited for you and your family! Congratulations to your family! Hugs! Thank you everyone! I appreciate the well-wishes. She is super sweet and luckily handles stimulation well since her siblings are obsessed. For the questions, I am writing them down and will do posts on them! Kendra, I think I just ignored her comment, but if she had been asking rather than informing me, I would have tried to explain it in actual terms. That is just the way I am 🙂 You can always count on McKenna for a funny comment. She is just precious! Blessings to the all 6 of you!! Congratulations! What a wonderful story of how God blessed you with this sweet little one. Congratulations! Brinley is beautiful just like her name. Congratulations on Sweet Miss Brinley. I've never commented on your blog before, but have been following it regularly since I had my daughter, who is now 1&1/2. Your blog was so helpful as I got Charlotte in a routine from the beginning. I found the Babywise books to be vague in a number of areas, and the details you gave of your personal experiences were so helpful. Thanks so much! I've recommended your blog to many people who were interested Babywise. Enjoy your new addition! I'm so happy for you and your family! Congratulations! The weird connection is my due date was the same as yours with Brinley AND that was the name we were going with if it was a girl. 🙂 I ended up miscarrying but I know it's all apart of God's plan and I have learned he is in control. Thanks for sharing your insights and for giving us all hope. God bless you and may you give yourself grace during these new few months. Congratulations!! Thanks for your blog. Congratulations! I love your blog! It has helped me so so much! You and your baby are beautiful! What a lovely picture!